As I have said before, I was very sick and one of my diagnoses was Candida Yeast. I had yeast overgrowth just about everywhere in and on my body. It was found to be causing my shortness of breath. I found out on my own it was also causing my indigestion, GERD and general run down or burned out condition. Candida Yeast is a serious illness, I will spend more time on it in a future article. There are several websites that have dedicated articles and programs on Yeast overgrowth and many programs of assistance. One site run by Carolyn Dean is Yeast Connection. Another site with instructional videos is Majid Ali, MD. You can learn more about yeast fermenting in your stomach and causing gas and bloating that can turn into heartburn and other serious illness. This article is part of my continuing discussion on how I regained my Health especially the health of my Gut or what is called the digestive system. The first article was “Are We Too Clean”. The next article was the importance of pickling Pickling A Lost Tradition. Todays article is an introduction to digestion and the use of Vinegar – Apple Cider Vinegar (ACV) to be exact – as one of the homeopathic remedies I used to help me detox and return balance and function to my digestive system. Not just any vinegar will do it must be raw, unpasteurized, unfiltered, un-cooked, and made from natural food and with the ‘Mother’ load. Fiber (Prebiotics), Heartburn, inflammation, inflammation and free-radicals, pH balance, and the eating of bitter foods including the lemon. I tried them all. I slowly removed processed food and grains from my diet. Processed foods loaded with processed carbohydrates and processed salt and sugar. I stopped all intake of trans fat like Crisco, Canola Oil and Vegetable Oil. I began to increase my intake of saturated fats like coconut oil, and polyunsaturated fats like avocado, olive oil, sesame and others. I increased my consumption of grass-fed beef, chicken and pork. I increased my omega-3 fatty acids. I had a thyroid problem and slowly increased my intake of iodine and magnesium. Once I stopped eating the Standard American Low-fat diet and increasing my intake of raw natural food, my health and strength slowly improved. I have written many articles on how I broke that addition and what foods I ate. But I had more to do. — Pain unbelievable pain. Forth of July fireworks kind of pain first in my knees’ then it slowly moved to my hips, then to my back both lower and under the shoulders. I had tremendous pain just by standing up. If I waited a few minutes my muscles would adapt and I could walk. But I was in constant pain. My body had surfaced buried toxins and was overwhelmed. I had to learn to help. Just eating good food wasn’t enough I had to figure out how what else to do. I spent a great deal of time searching and reading what I found off the internet. How I handled the pain is a much more complicated subject. When I was younger and had energy, then I began to have pain. The pain was like this just milder and it went away eventually. But this pain was not going any where any time soon it just kept getting worse. I have written articles on pain and the lymph system in skin brushing and there is much more to say about it. There will be other articles but the best help was massage, rubbing using oils, and some simple stretching exercises. Sweating is also very good but since I live in the cold NorthEast part of the United States sweating isn’t a practical option. Sunshine is sometimes hard to find. As I said, one of the foods I used to help detox and return digestive balance, was Vinegar unfiltered, uncooked, natural vinegar – so lets talk about Vinegar. 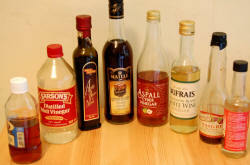 When I started researching vinegar I was surprised to learn there are dozens of vinegars. You can make vinegar out of just about any food and there are many variations. The most common vinegars used in America are the white distilled and apple cider. The basic principles of making vinegar hasn’t really changed since the ancients. First a food is fermented by converting its sugar to alcohol then fermented a second time to turn the alcohol into vinegar or what is called acetic acid. Part of this second step is how they can create what is called the “Mother Load”. 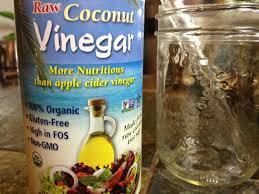 “Mother” of vinegar is a cobweb-like amino acid-based substance found in unprocessed, unfiltered vinegar. Most manufacturers pasteurize and filter their vinegar to prevent the mother from forming, but the resulting “sparkling clean” clear vinegar is devoid of the reason vinegar is so useful to your health. Vinegar is made from any carbohydrate that has enough sugar to be fermented, including apples, beets, coconut, dates, grapes, and potatoes. Vinegar is then made from all colors of wine. Vinegar is also made from grain and malt. Vinegars can also be synthetically created in the lab and contains only acidic acid without any natural acids or enzymes. Most Distilled vinegar is created this way. It does not hold a candle to real vinegar. Some vinegars like Balsamic vinegar are aged like some expensive wines. I was also surpassed to find that not only Apple Cider Vinegar comes unfiltered, raw and have a mother load but many others do also. Most of your specialty vinegars are not pasteurized and some very good Balsamic vinegars and vinegar from coconut tree sap have a mother load. See a list of vinegars at the end of this article. I was also very happy to find . It is much like Apple Cider Vinegar but has a softer taste. I now use it in the morning and on my food. It is a little expensive so I’m still using ACV for my skin. For now let’s concentrate on the most popular vinegar and that is Apple Cider Vinegar the one labeled Natural, Organic, Raw (uncooked), Unfiltered and Unpasteurized. The one that looks cloudy and has the Mother load. 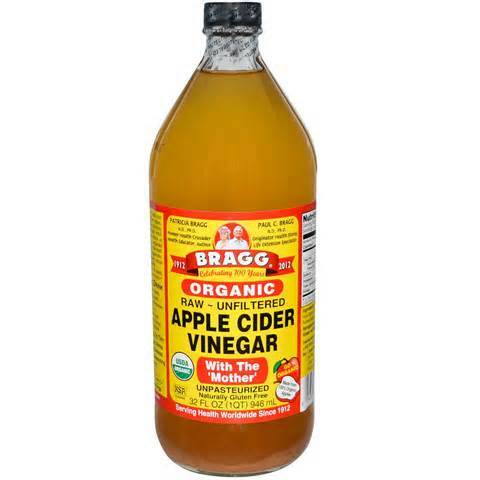 For now let’s look at the importance of one brand of Apple Cider Vinegar called Bragg. The history of this product is important to the history of food production in the United States. I know I’m at the risk of dating myself, but a little history adds variety and variety is the spice of life. Right! 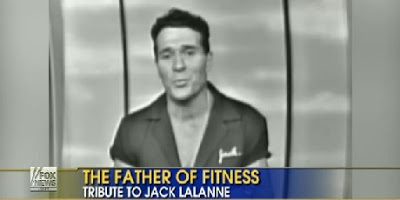 Anyone remember Jack LaLanne? Anyone remember Arnold Schwanager – How about anyone know where juicing first got started? Jack LaLane the original fitness advocate, muscle, strong arm, body builder, and health advocate. Jack LaLane was the first advocate to introduce fitness, and juicing to the Nation. He published numerous books on fitness and theThe Jack LaLanne Show between 1953 and 1985. He was recognized for his strength and success as a bodybuilder. He even beat 21-year-old Schwarzenegger (Mr. Universe) in a body contest. Arnold was the title character in the many Terminator movies one being Terminator 3: Rise of the Machines, which went on to earn over $150 million domestically. He basically was a high efficient machine with a heart. Back to Jack he introduced the concept of juicing and had his own juicing machine which is still being sold today. Jack LaLane had a troubled youth. He had dropped out of high school at age 14. The following year his mother took him to hear a lecture given by health food pioneer Paul Bragg. The talk was on health and nutrition, focusing on the “evils of meat and sugar. The talk changed Jack’s life. He became a student of Dr Bragg and an advocate for healthy living for the rest of his life. Dr Paul Bragg was one of the original pioneers for Health Food, including the first health food stores, and his own bottled version of Apple Cider Vinegar plus 365 other health foods. 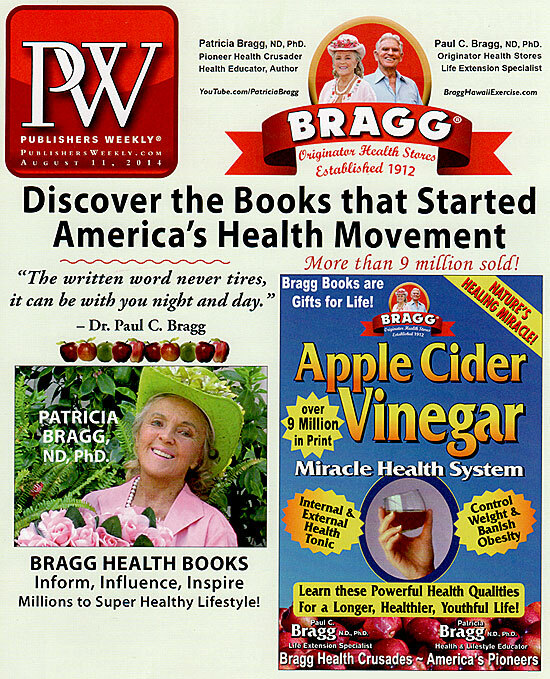 Since 1912 Paul C. Bragg and his daughter Patricia has been serving health to America, by first introducing health food including his own bottled Apple Cider Vinegar. Bragg worked with Olympic athletes, business giants like J.C. Penny and Dr. Scholl ( Dr. Scholl’s wart remover) and famous hollywood stars like Clint Eastwood and Charlton Heston. His daughter is carry the work and memory on to this day. Bragg’s Apple Cider Vinegar has the reputation of being “The Real Thing.” It has never, nor will it ever be cooked or pasteurized. You will find it on almost any Health food store and a growing number of Grocery Stores. 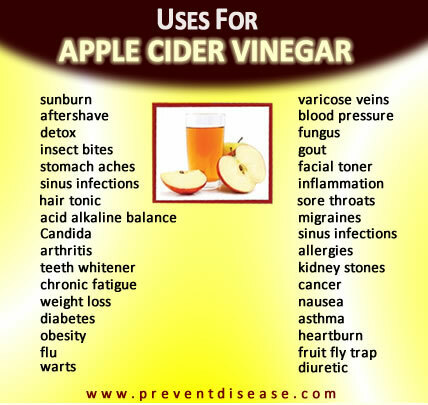 As listed below ACV has many uses and benefits. It is extremely useful to have around. Since the subject of this article is digestion or indigestion I will discuss only those features. I will cover the following benefits stomach aches, chronic fatigue, detox, fungus, heartburn, inflammation, and pH Balance. Vinegar has been with us since the ancients. It was accidentally discovered when a vat of wine turned sour. Vinegar is one of the most underestimated products on the planet yet it is being used today as the only agent to pickle foods. Vinegar is extremely useful in health benefits and it will preserve food but it doesn’t create the range of probiotic like a salt brine fermented food does. See my last article. 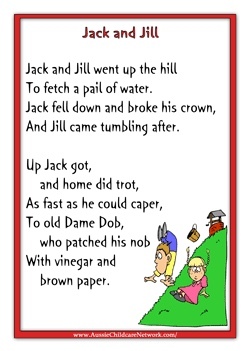 Do you remember the nursery rhyme Jack and Jill? Vinegar was even mentioned in the last line of the rhyme as a remedy for Jack’s headache—vinegar and brown paper. Vinegar and brown paper were a home cure used as a method to draw out bruises on the body. Vinegar is a diuretic which when mixed with water increases blood flow near the skin’s surface, so it helps to reduce the blood that has pooled in the bruised area reducing bruising and bleeding, There are other natural products that work which are Witch Hazel and Arnica Gel. As we saw in the article Are We Too Clean, the state of your health begins in the bowel. In a healthy bowel, the good and bad bacteria, yeasts (like Candida) are in balance. When yeast cells take over, they produce acid micro toxins that steal oxygen from the surrounding normal cells. The blood picks up nutrients plus the toxins and circulates it to the rest of the body. How well you digest and absorb food plus its elimination frequency and amount should be a very important aspect of your daily health monitoring. It seems like a forbidden subject for anyone to ask anyone about their bowel movements. When did you have your last bowel movement? That should be the first question you ask yourself, a parent asks a child and a Doctor should first asks a patient. Mahatma Gandhi the leader of Indian independence movement in British-ruled India was interested in more than nonviolence he was also very concerned for health. He wrote extensively on diet and health including vegetarianism. I read somewhere that every morning, Gandhi would first ask those around him did they have a good bowel movement? He would ask this before asking how they were. If they had a good bowel movement he knew how they were. Does you Doctor want to know? Gandhi knew the value of health, and a good diet of natural real food, but does you doctor even care about what you eat or even if you did eat? The state of our health begins in the bowel. Does your stomach hurt? Do you have bloating or gas? I once complained to my doctor about my unusual bloating and gas and he suggested I buy the product “Bean O” to reduce the acid cause when eating beans. That was before the great Big Pharma came up with the multi-billion dollar anti-acid windfall market. Maybe the next time you see your doctor ask him if he had a bowel movement that morning? He might just take the time to look up from his prescription pad. The Acid in Vinegar helps digestion return to a balanced microflora. Vinegar helps your stomach produce the acid it needs to properly digest the food you eat. There are many digestive aids. Basically any bitter food is an acid. Vinegar and the lemon are just some of them. Vinegar is Acetic Acid to be exact it is what gives vinegar its distinct tart taste. Vinegars pH is almost the same as a lemon or lime. These foods balance the pH of the Gut to an acid pH balance but also helps the rest of the system with its alkaline pH balance. Candida Yeast is hard to get rid of. I found I had to use any and all of these foods. Candida Yeast is not easy to control. You need to give your body a great deal of ammunition. Vinegar slowly fermented and unfiltered contain a long list of bioactive components like acetic acid, caffeic acid, catechin, epicatechin, garlic acid and more. It also has antioxidant, antimicrobial and other beneficial properties but these are minor when comparing the antioxidants found in eating fresh food. The most important thing about Vinegar is its acid. It is the only food that helps us with digestion. It has a long list of very helpful acid enzymes and other valuable acids. Your stomach uses Hydrochloric Acid to break down food to allow for digestion. When your system is balanced digestion goes on without any great fuss. This is a brief explanation. I am not a medical doctor and only had myself to experiment on. There is more to come and you need to do your own research. Indigestion is difficult or impaired digestion. It has many names including dyspepsia, heart burn, gastroesophageal reflux disease (GERD) or gastritis. Dyspepsia is a medical condition and its first sign I found was INFLAMMATION. Inflammation is the first sign of disease.It is characterized by a chronic or recurrent pain that comes from the front or back. It may be accompanied by bloating, belching, or nausea. Difficulty with digestion usually means you stomach does not have enough acid or the acid has become weaken by lack of oxygen. Pain is the first indicator – Pain is a sign of your body calling out for oxygen. Notice the swelling of the gut that is blotting and that is caused by yeast and fungus or out of balance pH acid. Acid hates oxygen and the bloating is a sign of lack of oxygen. The only way to improve your stomach ability to digest is to give your stomach more acid. The antacid pharmaceutical sales pitch claim PCP work but this medication covers-up and suppress the enzymes that produce stomach acid and hurt the very thing you were trying to help. As your condition worsens, your doctor may be found to say you need stronger medicine for you have an “Over Active Immune System”. Did you know Hydrochloric Acid has the same pH as battery Acid? With sufficient and normal Hydrochloric Acid HCl, all waste acids along with fermentation disappear. Hydrochloric Acid has the same pH as battery acid look at the following chart. Your stomach uses hydrochloric acid to digest food. To increase stomach acid you CAN NOT GIVE IT BATTERY ACID I HOPE YOU KNOW THAT. Acetic Acid which is the acid of the Lemon or vinegar is the next step up the scale. The acid of bitter foods including apple cider vinegar is called weak acids. You can dilute these acids with water and swallow. Taking a milder acid helps return the pH of your stomach back to an acid balance. These foods also provide you with enzymes and other acids used in digestion. Your stomach can then go back to digesting instead of fighting for oxygen. Your stomach can now produce the hydrochloric acid it needs to work without you knowing anything about it. Note: if you ignore it it will not ignore you. Overtime it will keep telling you it needs help. Just remember to dilute acetic acid with filtered water, for if taken straight you will feel a slight burning for it is an acid. I use it so much I dilute it to drink for it burns going down the hatch, but use it direct on my skin. Two teaspoons of ACV in an 8 ounce glass of water should do it. ACV works great on the skin. When I was a kid it helped me with my sun burns and now that I’m older ACV is still helping me fight this unbelievable itch and rash of yeast. Some people like myself use it straight on the skin, others dilute it in lukewarm water. (Straight vinegar may sting a little because of the acetic acid.) Apply gently with a cotton ball or lay a soft washcloth soaked in the solution on the area. Apply on the hour as needed. You can even try soaking in a bath of about one cup of vinegar added. As I said, I had candida yeast everywhere including a very runny nose. Candida yeast is hiding in my sinuses. ACV helps detoxification by breaking up mucus throughout the body and cleansing the lymph nodes to allow for better lymph circulation. A healthy lymphatic system can remove toxins from the cells in the body while improving immune system response. Vinegars can be made from many different foods that add their own tastes to the final products, but additional ingredients, such as herbs, spices, or fruits, can be added for further flavor enhancement. Note all vinegars are acid and if they are not pasteurized or cooked can benefit digestion. Cane Vinegar -This type of vinegar is produced from the sugar cane and is used mainly in the Philippines. It is often light yellow and has a flavor similar to rice vinegar. Contrary to what you might think, cane vinegar is not any sweeter than other vinegars. Malt vinegar – is made from Malt or barley. It is a favorite in Britain reminiscent of deep-brown ale. It has a light brown color and malt flavor. It is very popular where it’s used as a condiment for fish and chips. Raisin Vinegar – This slightly cloudy brown vinegar is traditionally produced in Turkey and used in Middle Eastern cuisines. Try infusing it with a little cinnamon to bolster its mild flavor. Salad dressings made with raisin vinegar will add an unconventional taste to your greens. Rice vinegar is most commonly produced in China and Japan from rice wine that’s allowed to ferment. It comes in black, brown, red or white varieties. Used in Asian cooking include sushi, salad dressings and stir-fry. vinaigrette – salad dressing of oil, vinegar, and herbs. Wine Vinegar – Wine vinegars are made from any color of grape, and aged wine you can think of – for Example: Balsamic (aged wine), Champagne, Red, Sherry, and White. Many of these vinegars have fruits, extra herbs and spices added in for flavor. The quality of the original wine determines the quality of the vinegar. Champagne and Balsamic vinegars come from wine that may have been aged for 25 years or more. Balsamic vinegar – Balsamic vinegar must be made from a grape or grape product. There is commercial and traditional balsamic vinegar. Traditional is made in a special place in Italy, called Modena where balsamic vinegar was born. Traditional and many commercial balsamic vinegars are unfiltered, not cooked or pasteurized and can contain a mother load. The older the vinegar the sweeter and more syrupy it is. Traditional balsamic vinegars are artisanal foods that have been aged for over 25 years and can be very expensive. The aging process uses a variety casks made of a variety of woods. Each producer has their own formula thus the flavors can be as rich as some aged wines. Vinegar made this way carries a seal from the Consortium of Producers of the Traditional Balsamic Vinegar of Modena. Distilled or white vinegar is the most commonly used in commercial production for making pickles, ketchup and bottled salad dressings, among other products. The vinegar is made from distilled alcohol that is fermented. White vinegar is very strong and besides for cooking, its best use is for cleaning. White Vinegar is a clear, It is made either from grain-based ethanol or laboratory-produced acetic acid and then diluted with water. Its flavor is a bit too harsh for most cooking uses, but it is good for pickling and performing many cleaning jobs around the house. Note the pickling only preserves the food it does not provide probiotics. Wild Fermentation by Sador Ellix Katz – Sador had HIV AIDS (1999 – 2000) and used fermentation to control the disease. She is no longer waiting to die but alive and kicking.